Freddy and Pamela were just coming off the water as Jennie, the dogs, and I arrived at Bird Island Basin. 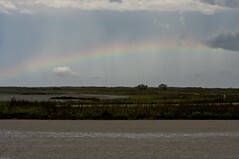 We had just driven through an ominous rain storm on the mainland, but the island was dry and slightly breezy. Since the wind wasn't enthusiastic, Jennie spend her afternoon working with Basil and Mouse in the water. 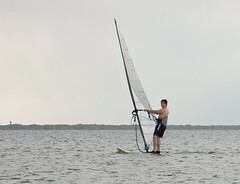 I assembled my windsurfing rig and had fun with light-wind jibes and fooling around. Once the wind picked up a little, Randy taught Freddy the jibe, and instructed Pamela in the intermediate windsurfing class. Freddy was kind enough to give me a few jibe pointers afterward. Jennie and I got dinner at Waterstreet Seafood, but had disappointing service. Disappointment seems to be the trend in the Corpus restaurants I pick. Jennie and I drove to the beach early to find no wind. I purchased a copy of the Tricktionary II from Worldwinds so I could get some book learning done. Jennie took turns exercising each of the dogs in the water while I looked at the pretty pictures. After about a half hour, the wind picked up to the 10-15 MPH range, allowing Jennie and I to enjoy some sailing. Noting the black clouds brewing on the horizon, I kept my tacks close to shore. After surfing for a half hour, I joined Jennie in the shallows to give her some pointers. This went on maybe ten minutes before distant lightning and thunder prompted us to drop our carbon lightning rods and get off the water. I walked into Worldwinds to avoid the rain and noticed that they were listening to sever weather warnings on the radio station. Severe weather means business in Corpus Christi. With some sense of panic, I ran back outside to re-evaluate the conditions. Black clouds: check. Forks of lightning: check. Gusty winds: check. OK, that might be severe. I ran back to my board, detached my sail, and threw it on the beach. 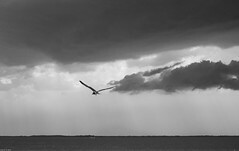 I could hear the occasional drop of rain pocking into the sail as the black clouds crept closer. I crossed my fingers that I could de-rig before the winds got too strong. I unfastened the outhaul, removed the boom, and threw it aside. Meanwhile, the thunder and lightning had moved to within a few miles of us. I loosened the downhaul and started to pull the mast from the sail. The sail material crinkled and slapped in the increasing winds. To prevent my sail from flying to Madagascar, I pulled the mast out in stages, careful to keep the sail close to the ground. I rolled the sail as I removed the mast to keep it from blowing away. As cold rain poured on my back, I rolled my sail into a dirty tube, jammed it into the bag, and threw it into the back of the Orange Toaster. The rain mixed with tiny bits of stinging hail. I pulled the mast apart and jammed it next to the sail. Thunder thundered, wind howled. I rolled up the Orange Toaster's windows before running to the Worldwinds building for shelter. The storm passed over us within a just a few minutes, clocking a peak wind speed of 40MPH. Freddy and Pamela arrived on the beach not long after the storm hit, just in time to enjoy a little time on the water before dinner. For Dinner, Freddy and Pamela met Jennie and I at a new restaurant for us: the Ichiban Buffet. This wonderful establishment probably didn't factor hungry windsurfers into it's $13 per person, all-you-can-eat price. It really is amazing how much sushi a sailor can eat after a day on the water. Freddy ate half his weight in crab legs, I ate three or four plates of Sushi, and we were the last patrons to leave that night. The staff was quite gracious considering our enormous appetites. Jennie and I met Freddy and Pamela at La Bahia for a Mexican breakfast. As always, the food was tasty and inexpensive. At the beach Pamela, Jennie, and I all windsurfed while Freddy spent the majority of his time kayaking the Laguna Madre with Gumbo and Bitsy. The winds started light and gradually increased until I could consistently plane. It grew to the point that Pamela and Jennie felt overpowered even after dropping to sails in the 3 square meter range. On the bright side, this meant that Freddy got a chance to swap the kayak for a windsurfer. He sailed out and practiced his beach starts and harness work.